Surrounded by a modern stone wall and supporting a fairly dense tree cover, Windmill Tump long barrow is not easy to appreciate in terms of its original appearance. The name suggests that it once supported a windmill, but there is no evidence for this. The mound is about 61m long and 21m wide at the east end where excavations in 1863 and again in 1939 revealed a fairly narrow forecourt with a false-portal at the inner end. Traces of the portal slabs are still visible. The early excavations revealed two lateral chambers, one opening from each side of the mound. The north chamber contained the remains of ten adults and three children, the south chamber an unknown number of disarticulated individuals. Windmill Tump Long Barrow. Image © Adam Stanford. Both chambers were unusual in being set below the natural surface of the ground, with steps in the passage to facilitate access. 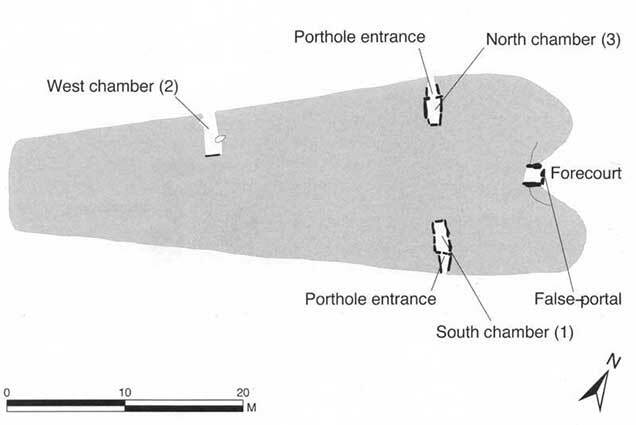 There were also carefully made jambs across the entrance to both chambers; a concave hollow in the opposing sides of the jambs formed a circular hole or ‘porthole’ which severely restricted access into the chamber itself. Windmill Tump Long Barrow plan. Image by Vanessa Constant. Sadly, none of these details are visible today, although the position of the chambers can be seen. In 1987 gales brought down a beech tree on the barrow revealing a third chamber in the northwest sector of the mound. Others may well await discovery. F 9325 9730. 5km NE of Tetbury, N of the A433. Access by footpath from minor road between A 42 9 and Rodmarton village, SW of the village. English Heritage. Further reading: Crawford 1925, 142-5 (CSS); Clifford and Daniel 1940; Saville 1989.